I just got back to the Midwest after spending four days in the Dominican Republic, so I apologize if some of my new-found Spanish vocabulary slips into the middle of a sentence! Anyway, as part of the new Peek Into Greek blog, we have decided to add a segment that will show you our new products and how you can use them in different ways. Personally, I like to think of myself as some what of a fashionista. In my chapter I was the go-to girl for fashion advice, and let’s face it, I’m just not ready to let that go yet. So, I present to you- Greek Chic. For those of you who don’t consider yourselves the creative type- I’m here to help you get the brainstorming process started. For those of you who are already fashionistas- this will be a place for you to learn about new products that you may not have known were available…plus, we all get creative block every once in awhile right? This week, I want to focus on Beach Chic. Summer doesn’t mean its time to stuff those letter shirts in that box of school junk you keep in the back corner of your basement. 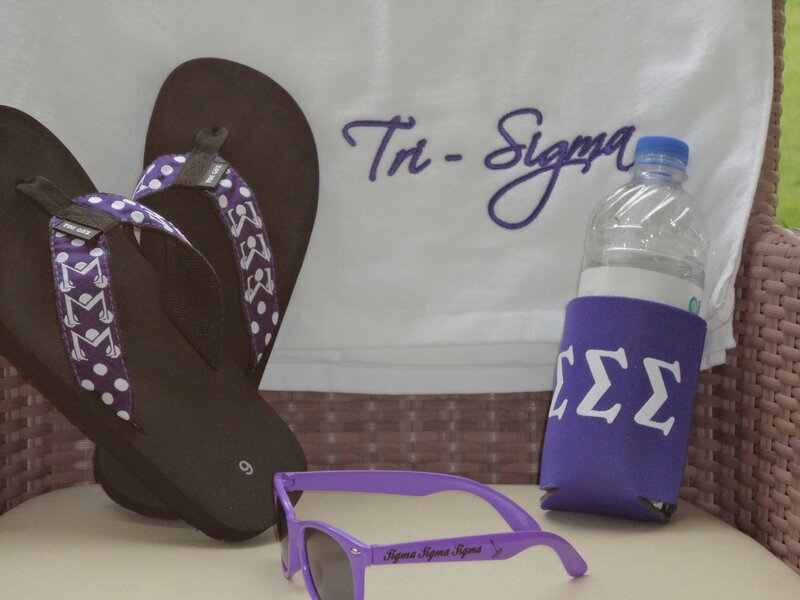 There are so many ways that you can rep your organization throughout the summer. Naturally, I decided to lead by example 🙂 so I convinced the bosses to let me take some gear with me on my vacay (have I mentioned that I have a really cool job?!) They sent me off fully loaded with a coozie, towel, flip flops, and shades.
. It’s pretty hot down there in the Dominican and the ice melts by the time the waiter hands you the drink. My coozie helped keep my drink cool and also prevented the excess water from dripping all over me. These are inexpensive and can be customized for any organization. We offer a few different styles and options so log on to see for yourself! *Fyi- these can be great for a fundraiser. One year my chapter was selling soda and water at a major campus event so we charged an extra dollar or two if they wanted a coozie with their drink- it was a huge success!
! These are so cute with the polka dots that represent your colors and the letters along both sides. Not to mention- these are SOO comfortable! I was shocked when I first put them on, it felt like walking on a cloud. Plus, they have a little bit thicker sole than most flip flops so they won’t wear out as quickly. These are a must for summer- trust me! 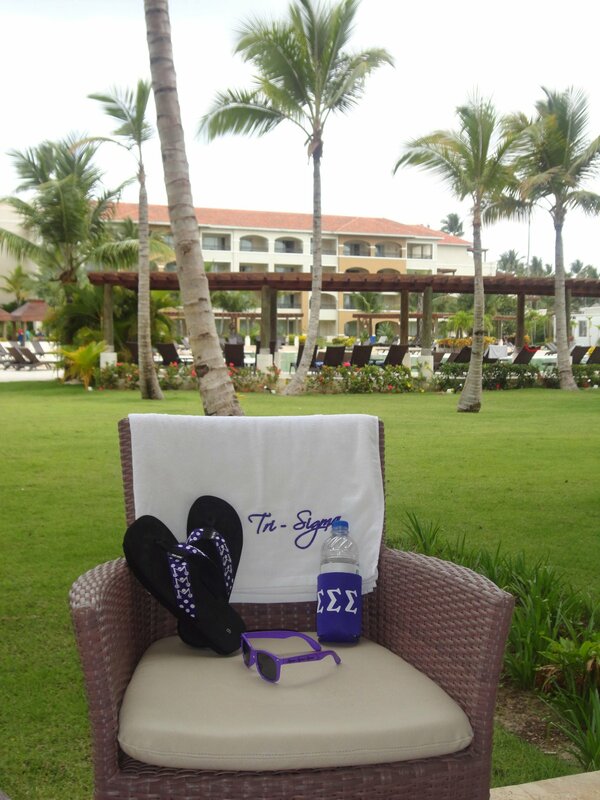 I took were purple (Tri-Sigma!) with Sigma Sigma Sigma spelled out, but you can also choose other styles that have just your letters. Here are a few more pics of my gear in the Dominican! I hope you all enjoyed this edition of Greek Chic! Remember, go online to http://www.greekgear.com to find all of these products and much, much more! If you have suggestions for more Greek Chic blogs, send them to me at mmark@inarush.com and I will make sure to give you a shout out! ← Meet the New Greek!